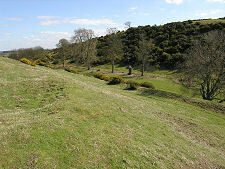 Chesters Hill Fort - not to be confused with the rather better known Chesters Roman Fort on Hadrian's Wall - is an Iron Age fortified village dating back approximately 2,000 years. Chesters, or "The Chesters" lies some three miles north of Haddington, and five miles south west of North Berwick. Access is signposted locally, and a parking area is available just within the gate of the property through which access is gained to Chesters. 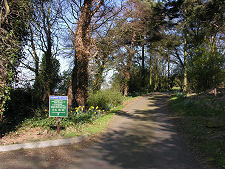 From here you walk up the drive and cross a grassy strip to your right to reach the gate to the west end of the hill fort. 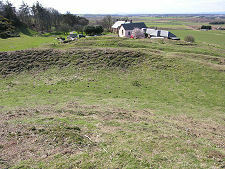 No one has ever systematically investigated Chesters, but it is believed to have comprised a village of roundhouses occupying the fairly extensive upper area of the hill on which it lies. Around these were dug monumental ramparts, presumably for defence. Those at the west end are especially impressive, even after two thousands years of attention from rabbits and gorse roots. But there is an obvious mystery about Chesters. 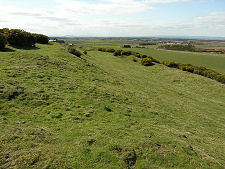 Look north from the site and the views extend to the Forth and beyond it to Fife. A magnificent spot for a hillfort, you might think. Well, no, not really. 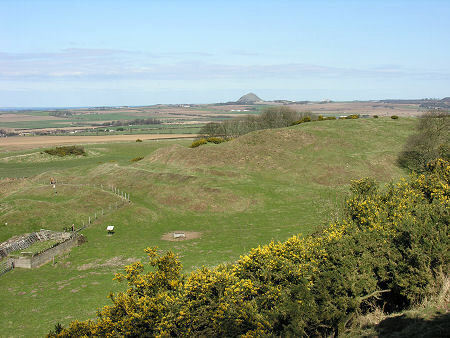 Look to the south from the hillfort and beyond a grassy valley the land rises above gorse covered slopes to a ridge rather higher than the hillfort itself. Anyone occupying that ridge could easily have rained stones and arrows down on the occupants of the Chesters, who would have been ill placed to respond. 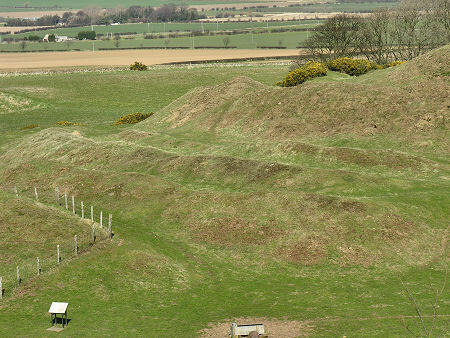 So: why build a hillfort in such a poor defensive position? No-one knows. Some have suggested that the fort was designed more for show than for real defence. 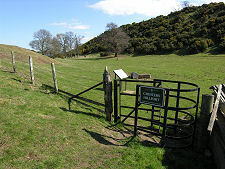 Some suggest it was a base of the Votadini tribe, allies of the Romans, during the period of Roman incursion into Southern Scotland (see our Historical Timeline). Whatever the reason it seems that part of the area of the hill fort was later overbuilt by settler for whom the dubious protection of the ramparts was less importan. This is a process that has continued right up to today, in the form of the house and buildings just to the west of the hillfort.